A mindful approach brings nature back to modernity. Close to downtown Seattle on a one-acre parcel, the site forms part of the planned Hilltop Community, known for its modern structures and its serene, off-the-grid integration of house and site. Designed by architect John Detlie in 1950, the Hilltop Residence itself is archetypical of midcentury modern residen­tial architecture. Broadhurst designed the complementing landscape to capture two moods: shadowy introspection on the entry side and sunlit expansiveness in the social / view area on the back. 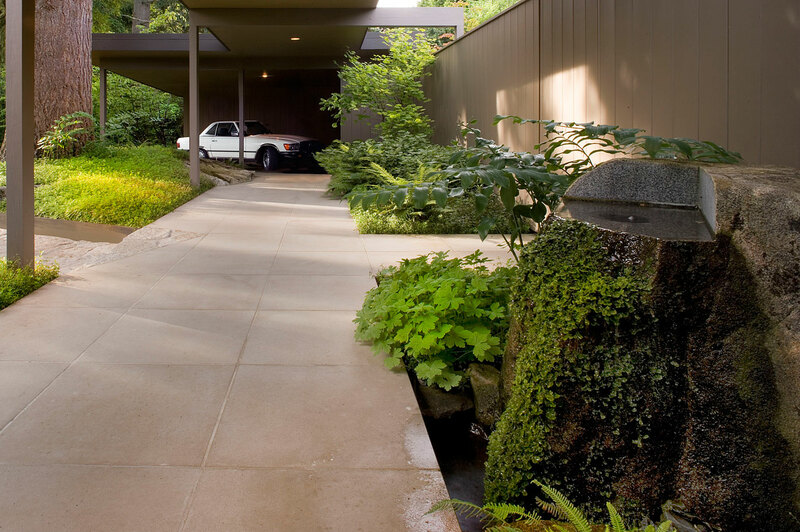 The “messy vitality” contrast shows up first on the entry side, evident in the treatment of the lush forest-floor ground plane, which is cut apart and spaced with the equally strongly expressed ground plane of custom pavers. A slow flow of water at the entry’s Wet Rock sculpture sustains the plush growth of moss and liverworts. Equally important, the entry’s ruggedly handsome, mature Douglas fir served as a starting point to connect the observer with a rhythm borrowed from the natural world, Broadhurst explains. On the sunny south side, the spectacular views set the planting philosophy: With Mount Rainier for context, na­tive and nonnative plants are massed for “an easy harmony, durability, and extended interest,” according to Broadhurst. Broadhurst says the most challenging part of the project was “marshaling my thoughts into a message seductive and cogent enough to keep all parties involved with the project inspired and on track.” And it is the “small details with gravitas,” such as the texture of the liverworts and the moss in the front, that make him smile. He also is happy that he chose to emphasize the Douglas fir’s role in the design. “The Doug fir most likely was planted as a sapling by John Detlie, so I feel I connected to him and his intent,” he explains. A granite path connects the lower level to the house and Sun Terrace, which was reconfigured so that it reads as an extension of its interior space. In strong contrast to the shaded plantings at the entry, sun-loving aromatics line a stone sitting wall at the top step of the granite path. 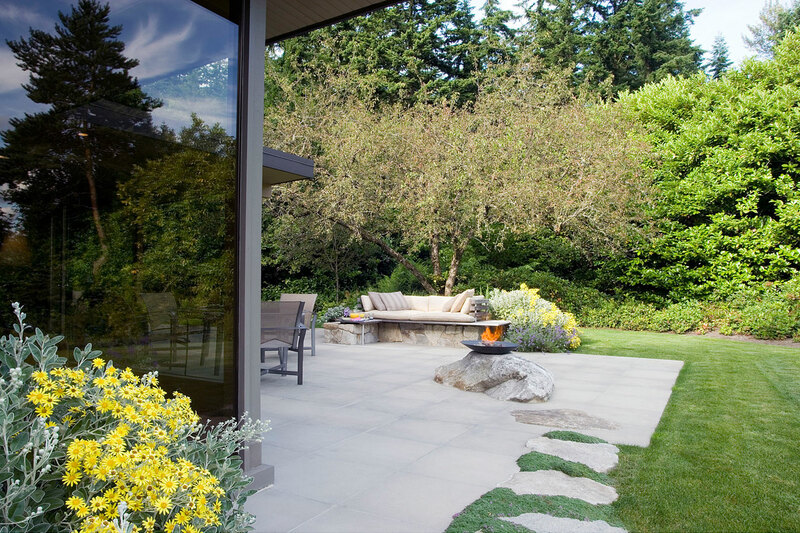 A stainless steel Day Bed sitting space and the gas-powered Fire Rock (bookend to the front’s Wet Rock) further define the back patio. Each year, the American Society of Landscape Architects, Professional Awards honor the best in landscape architecture from around the globe. 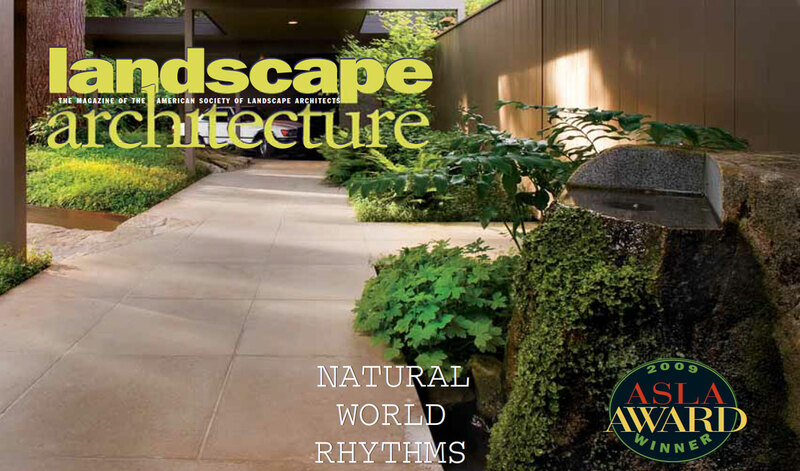 Award recipients receive featured coverage in Landscape Architecture magazine and in many other design publications. The prestige of the ASLA awards program relies in large part on the high-caliber juries that are convened each year to review submissions.